Honda Aircraft Company today announced that the HondaJet, the fastest jet in its class, has officially secured its first speed records over two recognized courses from Teterboro, New Jersey to Fort Lauderdale, Florida and Boston, Massachusetts to Palm Beach, Florida. The United States National Aeronautic Association presented the records to Honda Aircraft Company during the National Business Aviation Association's (NBAA) Business Aviation Convention and Exhibition in Orlando, Florida. 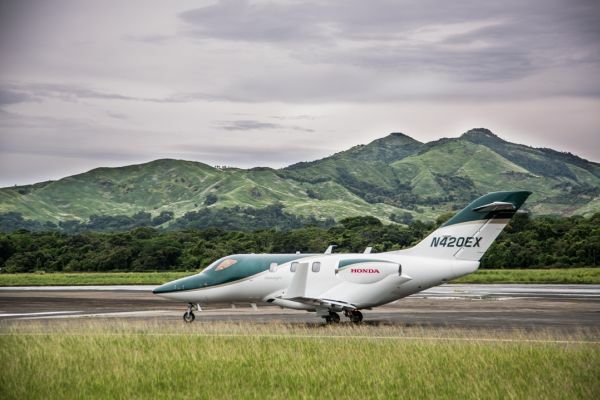 In setting the record between New Jersey and Florida, the HondaJet departed Teterboro Airport at 2:15 p.m. EST on April 9, 2016 and landed at Fort Lauderdale Executive Airport at 4:06 p.m. Despite average headwinds of 60 knots (nearly 70 mph), the 960-nautical-mile flight took two hours and 51 minutes at a cruising altitude of 43,000 feet with the HondaJet surpassing the existing record from Teterboro to Fort Lauderdale. Factoring the considerable headwind of 60 knots and high temperatures, the HondaJet achieved an average true air speed of 396 knots (456 mph) and maximum ground speed of 414 knots (478 mph) for this flight. For the Boston to Palm Beach record, the HondaJet departed New Bedford Regional Airport at 7:18 a.m. EDT on July 19, 2016 and landed at Palm Beach International Airport at 9:16 a.m. The 1,060-nautical-mile flight took two hours and 58 minutes. Factoring average 30 knot headwind, the HondaJet achieved an average true air speed of 385 knots and a maximum ground speed of 422 knots (486 mph). The HondaJet is the first aircraft in its class to officially achieve the Boston to Palm Beach record. "We chose several of the busiest business aviation airports with extremely popular routes to demonstrate that the HondaJet will get customers where they need to be faster than any other light jet," said Honda Aircraft President and CEO Michimasa Fujino. "These missions prove just how dramatically HondaJet design innovations like the Over-The-Wing Engine Mount increase performance and fuel efficiency over other light jets." The records are approved by the U.S. National Aeronautic Association and pending approval as world records by the Fédération Aéronautique Internationale in Switzerland. Peter Kriegler and Glenn Gonzales piloted the HondaJet on both flights. The HondaJet is the world's most advanced light jet, and its distinctive design incorporates advanced technologies and concepts. The HondaJet patented Over-The-Wing Engine Mount configuration, natural laminar flow wing and fuselage nose, and composite fuselage were developed from long-term research activities. The HondaJet is fastest jet in its class with a maximum cruise speed of 422 knots (486 mph); it soars highest in its class with a maximum altitude of 43,000 feet; and it is the most fuel-efficient light jet in its class by up to 17 percent. It has an NBAA IFR range of 1,223 nautical miles (1,408 miles).